Ready to Soar! 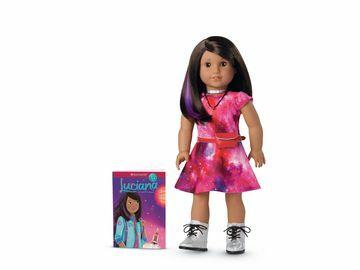 American Girl's 2013 Girl of the Year Turns Passion into Persuasion to Promote Arts Education | Mattel Inc.
MIDDLETON, Wis.--(BUSINESS WIRE)-- On January 1, 2013, girls everywhere will be inspired by Saige Copeland, American Girl's 2013 Girl of the Year®. Saige is a spirited and imaginative young girl who loves painting and horseback riding at her grandma's ranch in Albuquerque, New Mexico—the hot-air balloon capital of the world. When budget cuts take away art class at school and a horse she loves might be sold, Saige draws on her talents, mobilizes others, and takes action to improve the world around her. 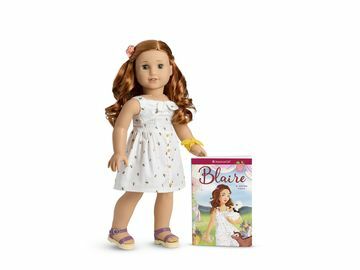 Saige's collection is available for one year; the character comes to life with a beautiful 18-inch Saige™ doll featuring long auburn hair and an array of outfits and accessories, including a hot-air balloon and a posable horse. And, to extend the fun for girls, a new movie based on Saige's stories will premiere in 2013 on DVD from Universal Studios Home Entertainment. The 2013 Girl of the Year books, Saige and Saige Paints the Sky, written by Jessie Haas, introduce readers to a nine-year-old girl who sees life as an open canvas waiting to be filled with what inspires her most—art and horses. When these creative outlets become threatened, she's driven to action. With a little imagination, confidence, and determination, Saige brings her family and friends together to raise money for an after-school arts program. The nonfiction section in the back of the Saige books features real girls who, like Saige, overcome obstacles and use their talents to make a difference in their communities. To support Saige's message of preserving arts programs in U.S. schools, American Girl is sponsoring a school grant contest and partnering with Americans for the Arts, the nation's leading nonprofit organization for advancing the arts and arts education. American Girl's "Shine On Now" charitable initiative will provide financial support to the organization's Arts Education Program, which provides arts education professionals with the information, materials, and resources they need to enrich student experiences with the arts. Elevate the Arts School Grant Contest: Starting January 1, elementary art teachers can enter to win one of thirteen grants totaling $45,000 for their schools' art programs by submitting a digital image of a hot-air-balloon-themed art project and a written essay that conveys why the arts matter in their schools. Entries must be received via the online form by May 31, 2013. Saige Learning Guide: American Girl has teamed up with Americans for the Arts to create this free, downloadable curriculum, which encourages children to draw on their imaginations and discover how creative they can be. Students in grades 3 to 6 will enjoy reading Saige's stories and doing the fun art activities outlined in this curriculum. Activities for parents to engage in with their kids are also available via Americans for the Arts' website: AmericansForTheArts.org/go/AmericanGirl. 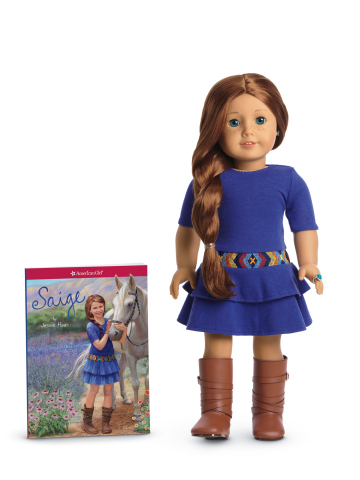 On January 1, 2013, the Saige collection will be available through American Girl's catalogue, at americangirl.com, and at all American Girl retail locations. To learn more about the Saige contests and promotions, go to americangirl.com/girloftheyear or American Girl's Facebook page at facebook.com/americangirl. To request a free American Girl catalogue, call 1-800-845-0005.